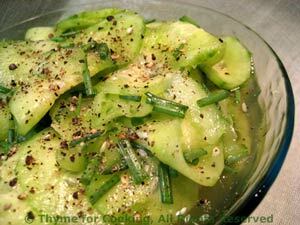 Old-Fashioned Cucumber Salad, a summer essential, quick, easy recipe. Add remaining ingredients, mix well. Serve. This gets better the next day. I didn't note serving size but, for me, it would be between 4 and 6 servings. The salt is mostly rinsed off.